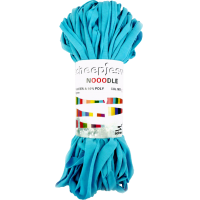 Scheepjeswol Nooodle is specially made for the true enthusiast who crafts the big tackles. Friendly to your fingers and easy to process by the flexible structure. Nooodle is constant quality and contains no residual material from the fashion and textile industry, so you are sure of a good result. The straps thread is elastic, light in weight and can be washed together with cotton.